After the annexation of Austria, the E44 locomotives were supposed to be used also on the alpine routes of the "Ostmark". In order to minimize the brake block wear during downhill ride, the installation of an electric dynamic brake was required. 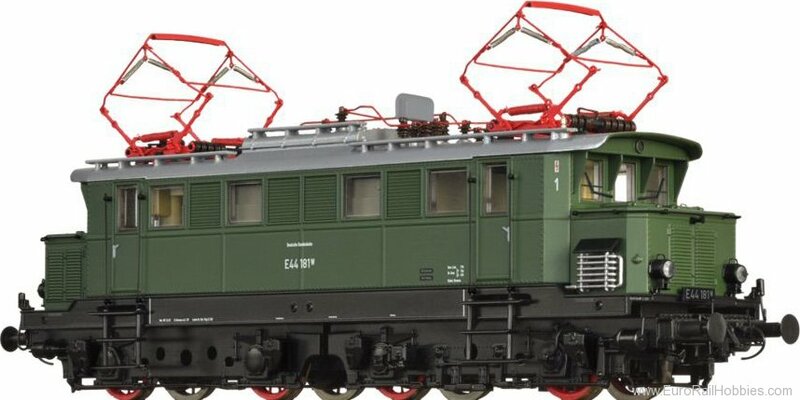 The German National Railway (DRB) ordered such an additional device for the machines of the batch E44 152 - 191 and referred to the subtype as E44W for "Widerstandsbremse" (dynamic brake). Because of the war, only the models E44W 152 - 183 were delivered between 1943 and 1951. Externally, the machines attracted attention primarily by the roof- mounted vent stacks of the dynamic brakes. After 1945, the German Railway (DB) maintained the dynamic brake only for the 16 Freiburg- based locomotives, which were used on the Höllental railway track, and referred to these as E44.11 from 1962 onwards, and as BR 145 after 1968. On all other machines, the electric brake was removed or, in case of a damage, decommissioned. The machines E44 1170 and 1180 survived; we can only hope that one of them will once again "hum" past the Hirschsprung (location where a stag is said to have leapt over the Höllental).